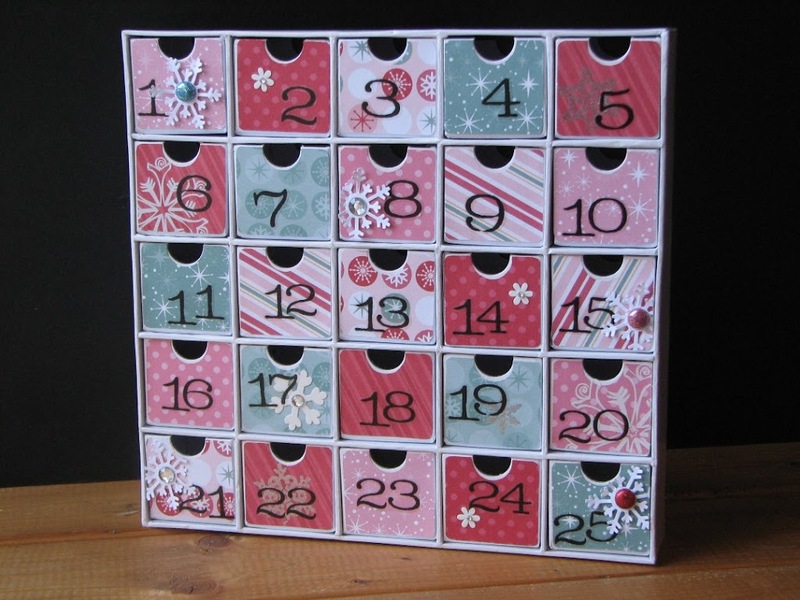 I saw the perfect advent calendar on Laurel Seabrook’s blog and remembered seeing one like it in Creating Keepsakes last year. So, when I saw the box at my local scrapbook store, Scrapbook Emporium, I knew I wanted to make one. The little boxes are the perfect size for a couple of chocolate balls or bells, which is the perfect treat for my two little ones. Laurel’s was my inspiration for this one, down to which paper I used! I used two papers from Jingle Level 2 and the two from Jingle Creative Basics, along with some old snowflake stickers I had, some punched with a Martha Stewart punch, and some from our glitter rub-ons as well as some white daisy rub-ons. I also used our Twinkle brads and sparkles. The numbers are clear stickers that come with the kit. I do plan to cover the top and sides with paper as well, but we’ll see when that happens. It was so fun to watch the kids open each box and get so excited about the same treats. I put a little note in #25 to tell them to go look in their boots for a bigger treat (a chocolate egg with smarties inside). Christmas became so much more fun this year as our kids get older and can really enjoy it. It’s magical through their eyes! LOVE, LOVE, LOVE it! You did a great job! Fabulous!! It is so fun to have a little treat for the kids as we count down hey? It is GORGEOUS. I saw these at our LSS and when I went to get one…it was SOLD OUT…SOB….next year for sure. This is just gorgeous! Really awesome!